We are aware that in Section 47 of the recent Notice of Consultation Lower Thames Crossing, Highways England have announced they have published the Statement of Community Consultation (SoCC). This SoCC document is something we have been hoping to get sight of for a while now, as it was issued to Thurrock Council in August. Highways England are saying that it won’t be available until Consultation starts on Weds, but since it has now been published as per Section 47 we should all be entitled to get a copy NOW. 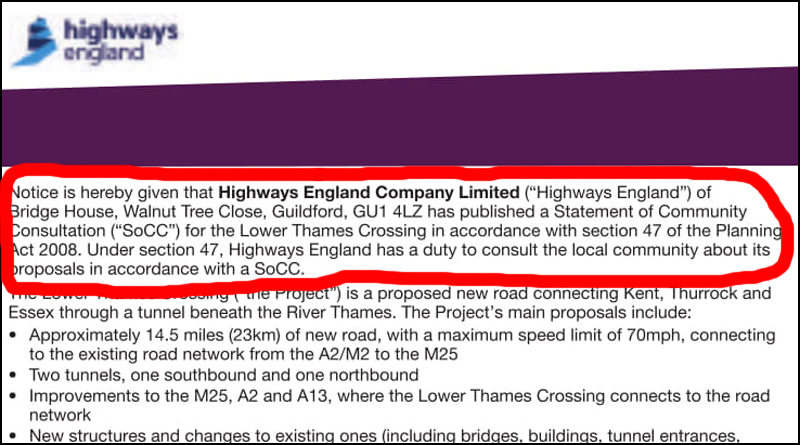 Please could you join us and email info@lowerthamescrossing.co.uk and cc ltc@highwaysengland.co.uk into the email straight away, to request a copy of SoCC as per their Notice of Consultation Lower Thames Crossing, Section 47.